This is not going to be another one of the endless string of depressing and discouraging articles on how ill-prepared you are for your golden years. About how you don't have enough in your retirement savings accounts. About how you should have started sooner rather than later planning for retirement. Yes, it's true that many Americans have simply ignored the fact that with the end of most pensions and the threats to Social Security, we're pretty much on our own in retirement. And surveys show that the average American has just $25,000 in the retirement kitty -- not even close to good enough. We're in trouble, but we're going to help you fix it. It's simply not too late to bulk up your retirement savings if you act now! Get started by learning the seven deadly retirement sins to avoid at all costs -- or a hellish retirement of scrimping and stress may be in your future.1. Turning your back on free money. If your company offers a 401(k) "matching" program, it will contribute a certain percentage, up to a set amount, of the money you contribute to your account. We hope you're taking full advantage of that match. If not, shame on you! This is free money we're talking about. We've heard from some people that they're not contributing to their 401(k) because they're scared of losing money in the market. We say "hogwash!" Every dollar your employee contributes is pure profit for you. And no one said you have to invest your 401(k) in individual stocks or mutual funds. Review your plan choices to find an investment option that fits your comfort and risk levels. 2. Underestimating how much money you'll really need in retirement to maintain your standard of living. The old chestnut that having 75% to 80% of your pre-retirement income in retirement will suffice is an outdated, inaccurate and dangerous formula. Have you been to the supermarket, a restaurant or the gas station lately? The cost of living is going up. Plus, while you may have some expenses that go away when you retire, you may also have some new ones to add (such as increased spending on health-care costs or travel). To live comfortably in retirement rather than constantly fretting about outliving your money, we recommend you plan to replace 100% of your pre-retirement income. This calculator can help you determine how much money you'll really need. 3. Treating your retirement account like a piggy bank. Too many people are treating their qualified retirement plans like a piggy bank, taking money out now to pay for high-cost expenses instead of waiting til retirement to tap this fund. But very often, money borrowed from these plans, such as a 401k or 403b, never gets paid back, with a potentially devastating effect on your retirement nest egg. We don't care if you need a new roof or that your child can't get a scholarship and needs help with college tuition: Don't tap your retirement plan for anything other than a dire emergency! Instead, consider taking out a fixed-rate home equity loan for the roof and have your child get a student loan for college. We know it sounds harsh, but the point is, do whatever you have to do to not touch that retirement account. 4. Relying too heavily on Social Security. For one-third of all Social Security recipients, that Social Security check is their only source of income. But Social Security was always meant to be extra income to supplement your retirement savings, not your only source of retirement funding. And in today's deficit crisis, even that safety net is at risk. Don't rely on Social Security too heavily in your retirement planning. And be sure you maximize your payments by knowing your correct Social Security retirement age. Start too soon, and you could lose up to 25% of your benefits! 5. Putting too many eggs in one basket. Too many people have an alarmingly high percentage of their retirement investments in their company's stock. Does Enron ring a bell? Have you looked at what happened to the price of big company stocks like GM? Many people lost almost everything when the bottom dropped out of those stocks. Diversify your investments among available investment alternatives. It's one sure way to protect your retirement funds from market risks. 6. Taking extra risk to make up for investment losses or lost time. It's a natural impulse: Your retirement funds aren't what they need to be, so you decide to invest more aggressively to make up ground with bigger gains. Don't do it! For starters, "aggressive" doesn't necessarily equal bigger profits. As the market reminded us yet again over the past three years, investing is risky business, and you can lose a fortune in the blink of an eye. That's the last thing you can afford if your funds are already short. As you get closer to retirement, you should be adjusting your investing mix so that you're taking less risk -- not more -- in order to protect your savings. 7. Ignoring the spending side of the equation. You often hear experts say how much you need to save for retirement, but saving is only half the equation. Having enough money for the retirement of your dreams isn't just about how much money you save, it's about how much you spend. Spending less on life's necessities now -- everything from life insurance to groceries to your mortgage -- will give you more money to save for retirement. 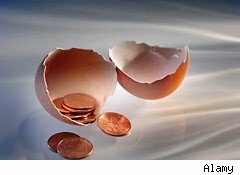 And you can make your nest egg, no matter how big or small it is, last much longer if you look at smart ways to save big bucks when you're retired. Here's the bottom line: It's not too late to plan and save for a happy retirement. It won't be easy, and we guarantee it will take some sacrifice. But if you use the tips we've just shared to get started today, you'll be well on your way to the million-dollar retirement you've always dreamed of.